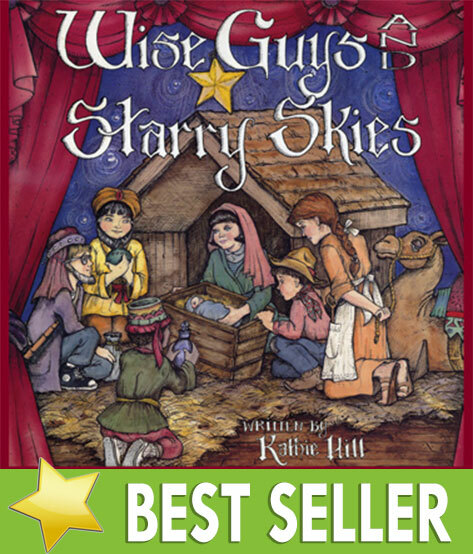 Wise Guys and Starry Skies Christmas : Kathie Hill Music, LLC, Making music with and for kids for over 25 years! Wise Guys and Starry Skies books are digital products and can be downloaded as soon as your payment has processed. All other companion products are physical and shipping charges apply. First released in 1984, Wise Guys and Starry Skies quickly garnered the Dove Award for Best Children’s Musical and was presented by thousands of churches, world-wide. The story centers a round Jesse, a boy who longs to be a wise man. He signs on as a camel boy with the three kings and other ‘wise guys,” cooks and camel boys. As they travel to find the heavenly king, Jesse shares what he knows of the coming Messiah through Old Testament prophecy and songs. When they finally arrive in Bethlehem, everyone’s heart is ready to receive and worship the newborn king. Money Saver: Hey! Check this out. Buying digital saves you money and time. You won't have any shipping delay or charges with any of our Kathie Hill Music digital products! Kathie Hill Classics titles include digital What do you mean digital? There is no manufactured product to ship. Instead you can immediately download the master files to your computer - PDFs to print, MP3s to burn to CD or play from an iPod or computer, or video (WMVs) to burn to a data DVD or play from your computer. and, using instructions provided, make copies equal to the number of licenses you purchased. Upon process of payment, log into your KathieHillMusic.com, go to MY ACCOUNT-ORDERS and download your masters. Because of the size of some files a broadband connection is recommended. Face plates and sequence inserts are provided. NOTE: Your honesty in making copies equal to your paid licenses will dictate whether we can continue this service. products. When purchasing Classics items which are digital you are actually purchasing a limited license to duplicate the item once you have downloaded it. When purchasing digital product you are paying for a limited license to duplicate the number listed. Most digital product is sold in multiples of THREE. 3x means you can make 3 copies. If you need 15 copies, purchase FIVE 3x licenses. If later you need to make 9 more copies, we trust you to return to the Kathie Hill Music eStore and purchase THREE more 3x licenses. Jewel cased CD with left channel instrumentation and right channel choral vocals (does not contain dialogue or solos). Downloadable 3x licensed PDF of all songs, script, production notes & piano transcription with permission to make 3 copies. Additional copies require purchase of additional 3x license/s. Digital download of an edited Listening CD and water-marked Singer's Book for preview purposes only. Jewel cased CD with full cover art and complete musical contains the entire musical with dialogue and songs. Paper sleeved CDs of complete musical with all song and dialogue. Full performance of musical by a children's choir.